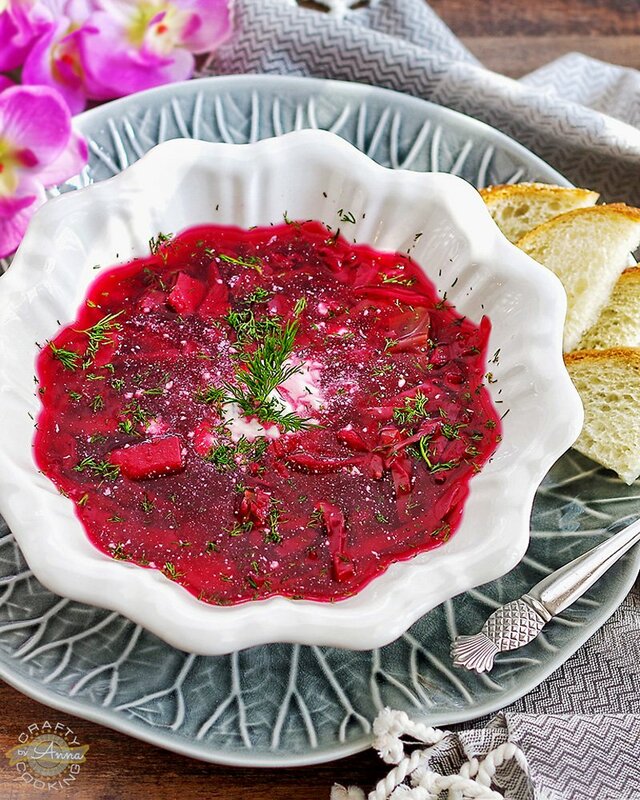 Vegetarian Borscht - a Hearty and deeply satisfying bowl of soup! 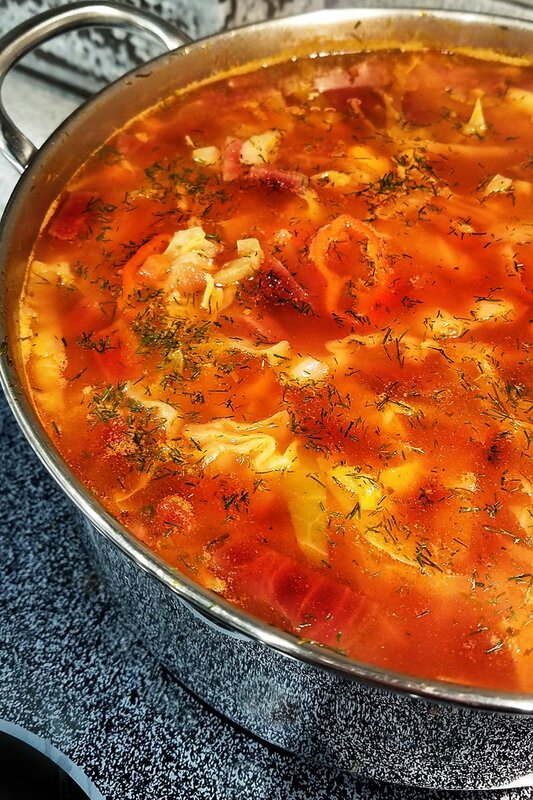 When the weather gets cooler, yes even here – in Sunny Florida, I make Borscht for us and usually a vegetarian version. I have used meat couple of times in the past, but we prefer just the veggie soup. 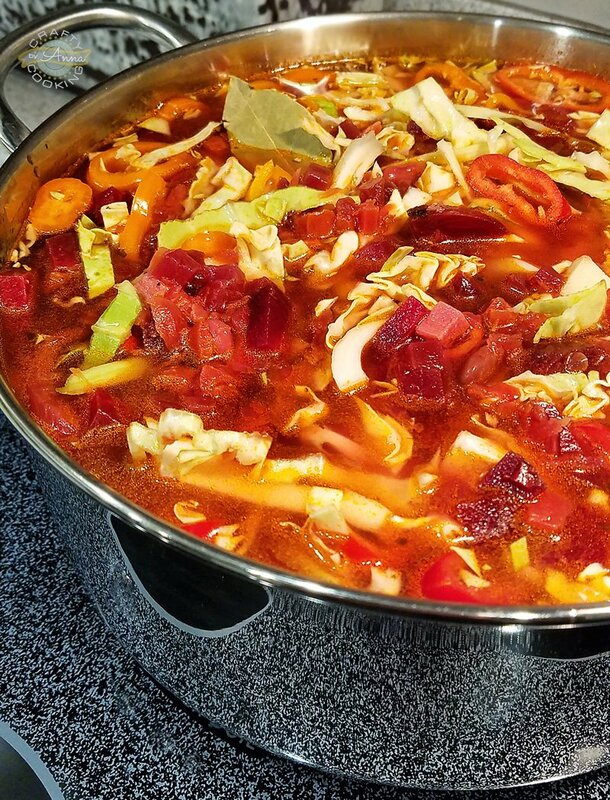 It’s a filling and deeply satisfying bowl of soup, with a sweet-sour finish. I made a huge pot and the leftovers have only grown tastier. 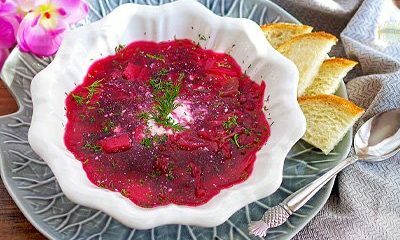 The main ingredient of Borscht – is beets, which gives the dish its distinctive deep red color. But dealing with beets can be a very messy process as you know. You need to wear gloves since the beet juice stains your skin. Sometimes, I take the time and shred the beets to get this unbelievably rich purplish color. But, if the color is not that important to you use canned Pickled Beets or I found these amazingly tasty “Love Beets” which are delicious cooked beets at Costo! They sell 4 pack package and you can use as many as you like for the soup, the rest you can make a Delicious Vinaigrette Salad! 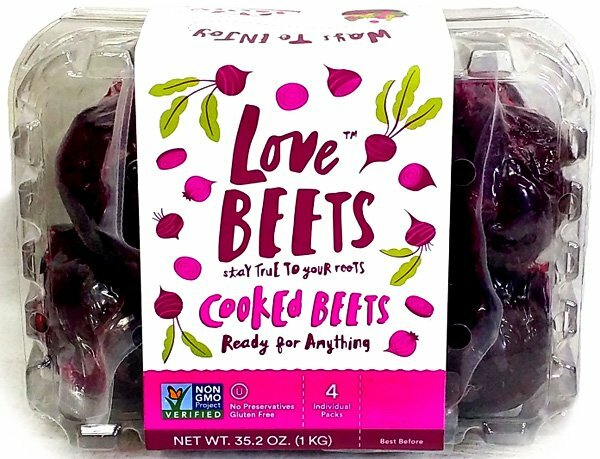 I found these cooked beets at Publix as well, but they sell one pack. 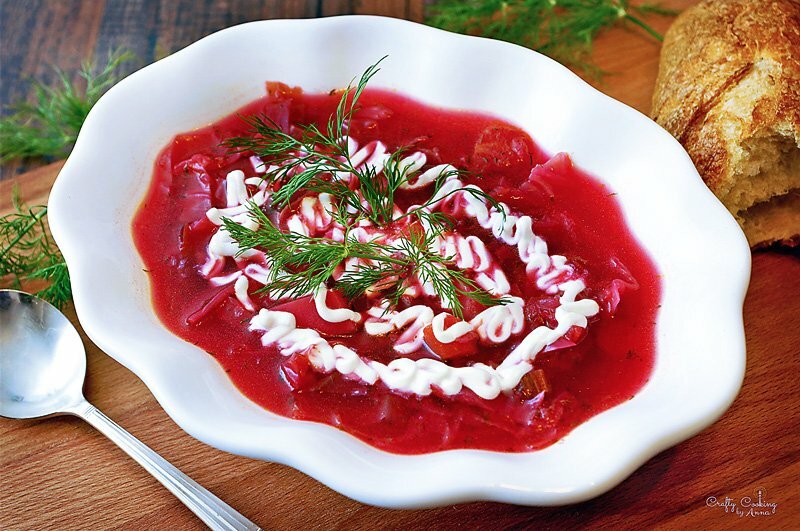 There are many different variations of Borscht. 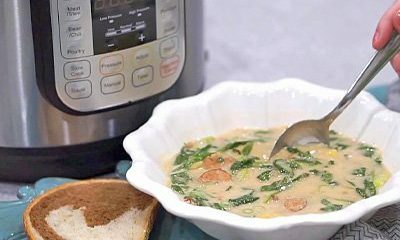 I do prefer the Vegetarian version of this popular across Eastern Europe soup. 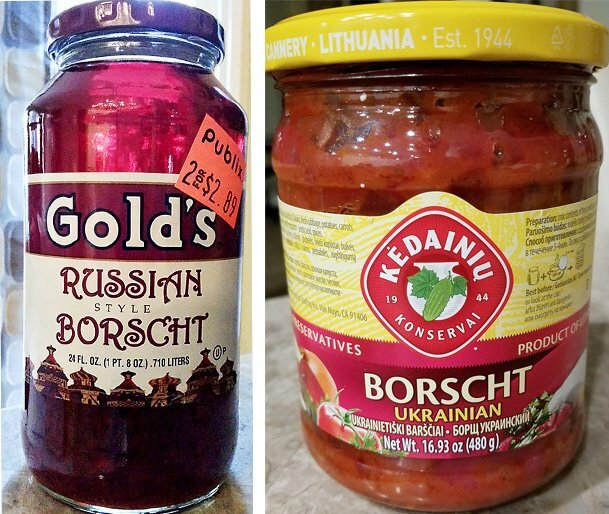 Few times I’ve added a jar of Gold’s Russian Style Borscht. It has an amazing flavor and readily available at many supermarkets. 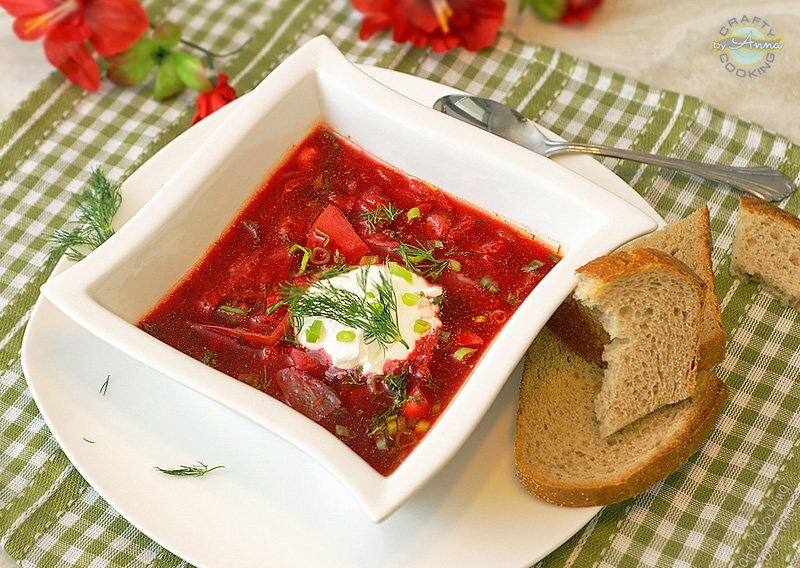 Or you can add this tasty Ukranian Borscht found in European stores. Before we installed RO (Reverse Osmosis) filtration system, I used to drag gallons of Distilled water every week to use in soups, pasta, rice, coffee, and tea. The tap water has too much chlorine and minerals and does change the taste. 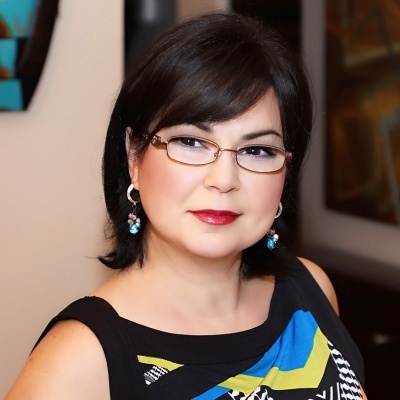 I would recommend using Distilled water if you do not have RO system installed. You can keep Borscht in the fridge for almost a week. Great Low-Cal, Low-Carb Lunch idea! You can eat it Cold during summer months and serve it with sliced cucumbers and sliced cooked egg (Ukrainian version), or Hot during the Winter months. If you use fresh beets you will get a deeper red color. 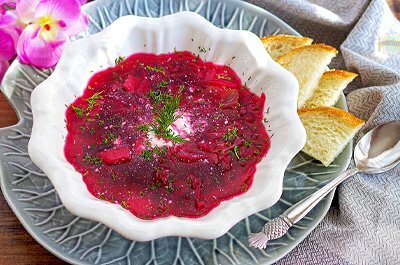 The above soup, I’ve used cooked “Love Beets“. 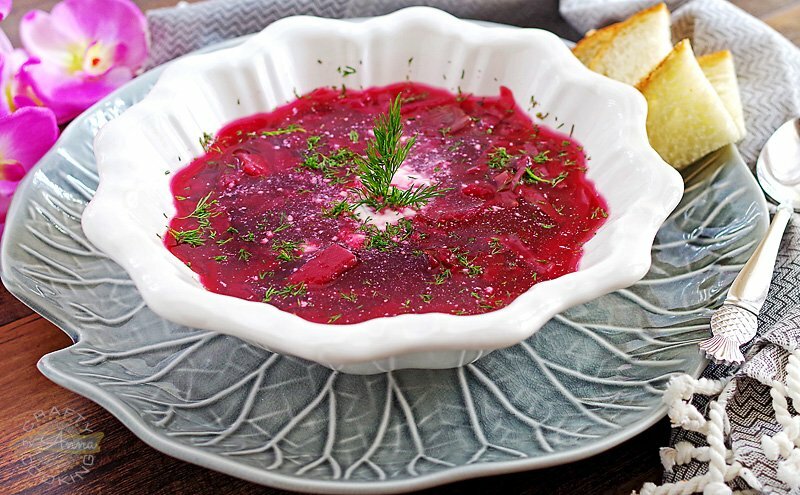 Borscht is low in calories (if you skip the sour cream) and full of vitamins and minerals. But who would want to do that? Sour cream adds so much flavor! Arrange the ingredients listed above (except for vinegar and lemon juice) in a large pot and bring to boil. 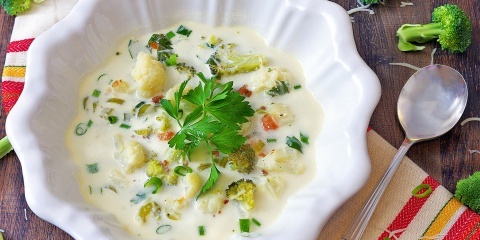 Reduce the heat and simmer for about 30 to 40 minutes stirring occasionally until the vegetables are tender. When the soup is almost done, add vinegar, lemon juice, and salt/pepper. Test and adjust the flavors. Serve with additional dill and sour cream.